On 11 February 2014, the Centre was delighted to welcome Dr Domhnall Uilleam Stiùbhart (University of Edinburgh and Sabhal Mòr Ostaig) to discuss ‘A Murder Mystery from Barra: The Killing of the Big Parson, 1609’. Below is this listener’s brief summary of the lecture. Dr Stiùbhart’s presentation examined a ‘single historical anecdote’: the murder of an island clergyman in Barra in 1609, the titular ‘Big Parson’ (Peursan Mór). In both characters and themes, this was a sequel of sorts to Ross Crawford’s presentation on the massacre of Eigg on 28 January. Dr Stiùbhart’s paper first examined the traditional story as recounted by 19th century natives (recorded by Alexander Carmichael), before assessing the contemporary context of the early 17th century. The story was recorded by Carmichael (well-known as the editor of Carmina Gadelica) in 1872 from either John MacPherson (1814-85) or his sister, Catríona MacFarlane (1807-80). Both narrators led action-packed lives. Island tradition states John enlisted in the army before quickly deserting, and his sister helped conceal him in a cave on Barra for six weeks. Later John fought on the Confederate side of the American Civil War. A resourceful woman in her own right, Catríona was best-known in later tradition as a witch. The Pearsan Mor was chapl[a]in & son to Macneil. He had [a] house at Ciolla & [was] m[arried] to a da[ugh]t[er] of Clanranald. He used to go shooting to Aird Ghrin [where] there was an oth[er] girl at Cliat upon his wife thought he was fond of her & she was g iadach rithe [jealous of her]. She sent for her 12 co[mh] [dh]altan [foster brothers] to Uist & they came. He was gone to Aird Ghrin as usual. His wife told them where he was gone & told them to wait him at Ciste nan Cli’eaun where they would hear his dog’s coinneal (chain) com[in]g tho[ugh] the ciste. They met & attacked him. He & his dog killed 10 of the 12 & the other 2 lived till morn[in]g. he fo[ugh]t them till he fell at Meallach where he was buried & a caibeal (chapel) was built over him. Although not explicitly identified as a Protestant, MacPherson’s version of the story is ‘antagonistic’ towards the faith and presents him as the archetypal ‘wicked clergyman’. A later 20th century account by Maggie MacDonald makes explicit that the Big Parson was a Protestant killed by Catholics, and claims that the Protestants were ‘afraid to pass at night’ the spot where he was struck down. Documentary evidence from 1633 claims that a Big Parson was indeed killed in Barra. Archibald Campbell, Lord Lorne, recounted the murder in a series of accusations against Raghnall MacDonald, the uncle of Iain Muideartach, Captain of Clanranald, who was a notorious troublemaker in Benbecula and Uist. Raghnall was accused of the murder of a ‘John McNiell persone & minister of Bara’ in June 1609 by Lord Lorne, a move clearly aimed at extending Campbell patrimony and eliminating the disruptive Raghnall. At the time of the alleged murder, the MacNeills were riven by internecine feuding between the offspring of the chief Ruairidh MacNeill (d. c. 1622), who had two wives: the first was Mór, a sister of Domhnall mac Ailein, Captain of Clanranald; the second was Màiri MacLeod, daughter of Uilleam MacLeod of Dunvegan. His first wife was apparently a legitimate marriage, while his second wife (or concubine) Màiri was a love-match, according to tradition. The ‘Big Parson’, John, son of Domhnall, presumably became embroiled in the dispute between Ruairidh’s six sons (three from each marriage) when he was ordered to support the sons of Màiri and administrate MacNeill and MacLeod lands. This made him a target for Clanranald aggression, who sought to press the claims of Ruairidh’s first legitimate marriage. Since the collapse of the Lordship of the Isles in the late fifteenth century, the MacNeills had closely aligned with the powerful MacLeans of Duart, who cooperated in ‘loose coalition’ with the MacLeods of Harris and the Mackinnons of Strath in Skye to counter the Clan Donald. However, after the MacNeills spoiled a merchant ship in late 1609, drawing the ire of King James, both the MacLeans and the MacDonalds intervened on Barra. In 1610, Ruairidh’s eldest son by Màiri, Iain, was seized by Domhnall MacDonald of Clanranald and sent to the Tolbooth in Edinburgh, where he soon died in captivity. Later, Eachan MacLean of Duart apprehended Niall Uibhisteach, eldest son of Mór, the first wife of Ruairidh and the sister of Clanranald. 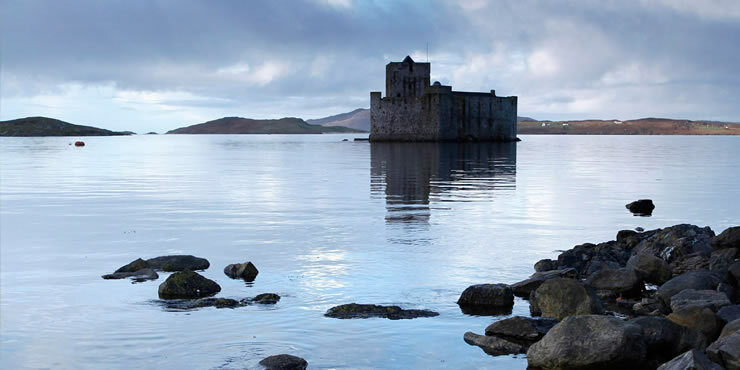 He shortly returned to Barra after an appearance in court, but in October 1612, the surviving sons of Ruairidh and Màiri MacLeod launched a successful attack on the MacNeill castle of Ciosmul. The elder surviving son, Niall, became clan chief and seemingly enjoyed the popular support of the clan. He also reconciled with the legitimate heir, Niall Uibhisteach, who was allowed a private fiefdom in the north of Barra, although this arrangement was apparently shaky. As for the Big Parson, he was a real historical figure and his purported murder in June 1609 does fit in with a picture of ‘increasing internal dissension’ and Clanranald aggression. However, it is significant that his murder is not alluded to in any contemporary documents, rendering the event ‘elusive’. Nevertheless, Dr Stiùbhart has vividly shown that tradition can serve as an entry point into a neglected area of early-modern Highland and Island history. While these sources can be ‘treacherous’, they have clear value by offering a Gaelic-centric approach (in this case, ‘Barra-centric’), which is a much needed counterpoint to the traditional government focus. The Centre seminar series continues next week, 18 February, with Prof Dauvit Broun, ‘How British is Scotland? Britain and Scottish Independence in the Middle Ages’. This will be held in the Western Infirmary Lecture Theatre at 5.30pm. Reserve your seat here. All welcome. Very interesting. Are there any songs or poems that refer to these events?